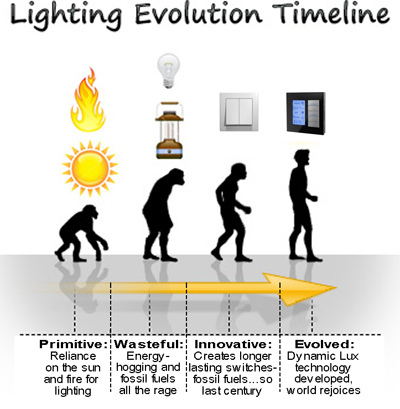 Over the past few decades there has been a shift in thought concerning the evolution of human culture. Ever since Dawkins, in his book The Selfish Gene, coined the term “meme” as the selfish unit of societal evolution analogous to the gene’s role in the evolution of species, there’s been a groundswell of people focussing on the evolution culture via memes. Dawkins suggested that memes, composed of memory and imagination, were the basic replicating units through which human culture evolved. Yet, memes simply do not fit the model of classic Darwinian evolution. Ideas are not passed on from one generation to another in a linear fashion as are genes. Most often, each person adds their own slant to an idea or may simply not understand it properly and pass on some distortion of the original (Chinese whispers). 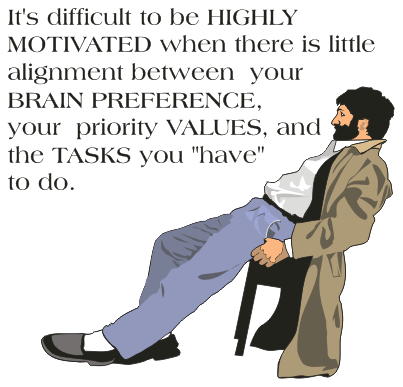 Also, people’s values have a profound impact on the transference of ideas. Values filter what people give attention to—people don’t even notice, let alone pass on, ideas which would make no contribution to what they value. People may also deliberately make a conscious choice to pass on, or not to pass on, particular ideas—knowledge is power. 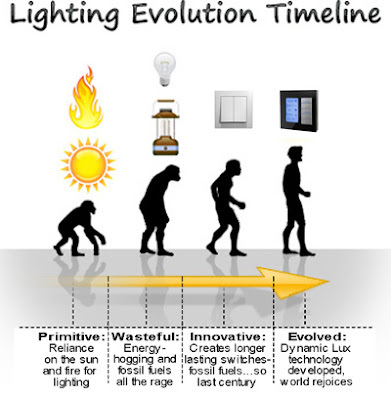 The impact of conscious selection at the stage of idea mutation and transmission blurs the distinction among the three elements of Darwin’s engine and suggests a very different way of looking at ideas than Dawkins’s notion of evolving memes. Picked over as carefully as meatballs at a cheap buffet, ideas are sorted by the finicky process of conscious selection. They are created, used, and discarded by active minds seeking their own advancement or their own comfort. What other element of our lives do we consciously improve for better function and pick carefully among to fill our cultural shopping carts? We can also consider ideas as tools. Q. If memes are not the mechanism by which culture changes, what is? A. 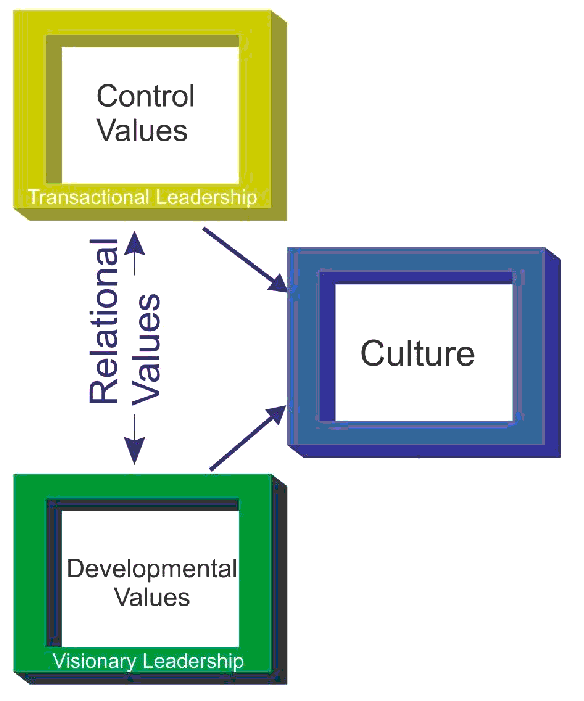 Changes in the culture's values-system, i.e. changes t its strange attractor. People often write about levels of consciousness which is curious, since no one yet even knows what consciousness is, let alone able to define levels of this elusive concept! 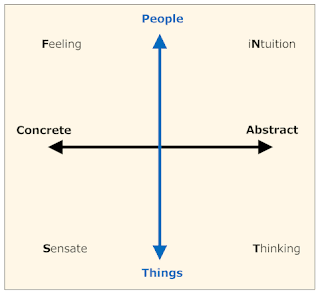 Brian Hall (Figure 1), Clare Graves (Figure 2) and others go so far as to suggest that human development is correlated to levels of consciousness. 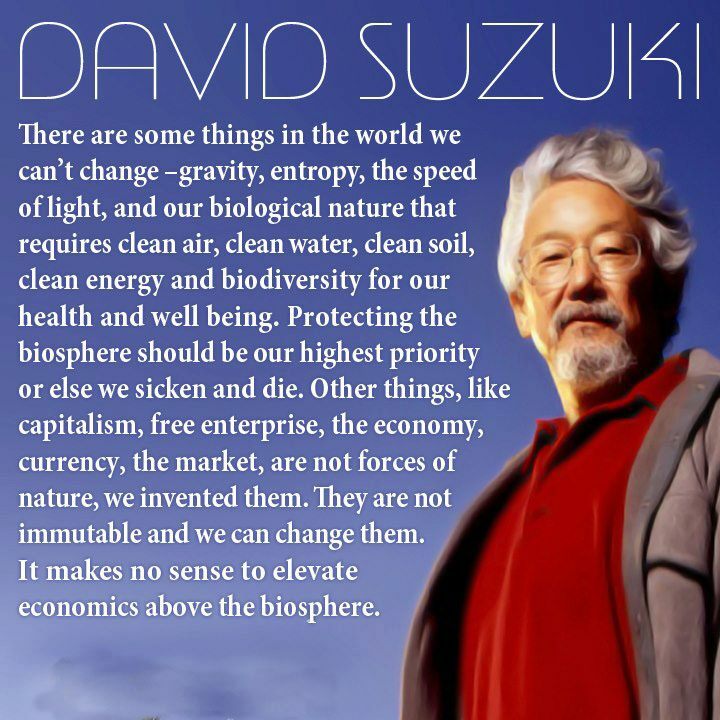 Evolution cannot be tied to growth, development, progress or any other like concept. Identifying someone is an evolved person actually says nothing about who they are as a person, in fact the statement is rather meaningless. 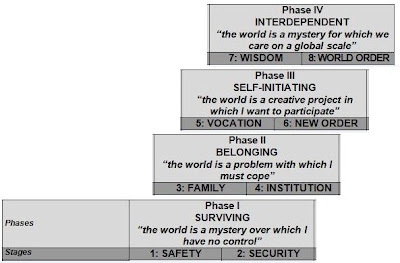 Levels of consciousness cannot be tied to values development. The cartoons of Figures 2 & 3 represent canonical icons--i.e. iconic depictions of an unconscious belief-set (in this case, a false belief-set) embedded in the psyche of Western culture. Interestingly, as highlighted by the side notes in the captions, these canonical icons are also linking males to evolution and progress. Figure 5 is the only one found which did include a female. How do you react to this image? Is it a cynical dig at the male concept of evolution and progress? Or, is it just using sexual imagery to promote something? Figure 5. What's the Canonical Message? In summary, there's no link between evolution and progress. In fact, letting this false belief guide our collective behaviour is a form of "cop-out": we don't have to think, put the brain in neutral and let random selection create a better world for us--"Sorry. It ain't gonna happen!" 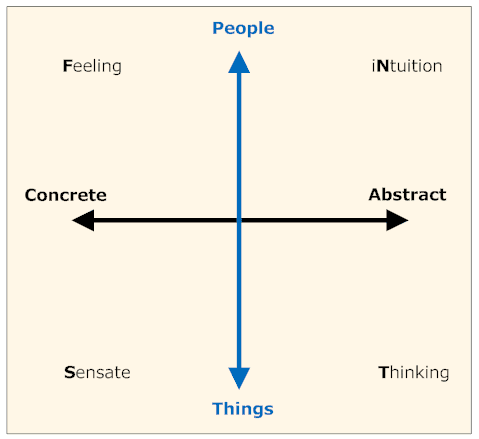 Figure 6 is a simplified version of the diagram Czikszentmihalyi uses in his video. Raised consciousness (flow experience) is linked to skills development. The link with values stems from the fact that we are only ever self-motivated to take on challenge and skills associated with activities which match our values. 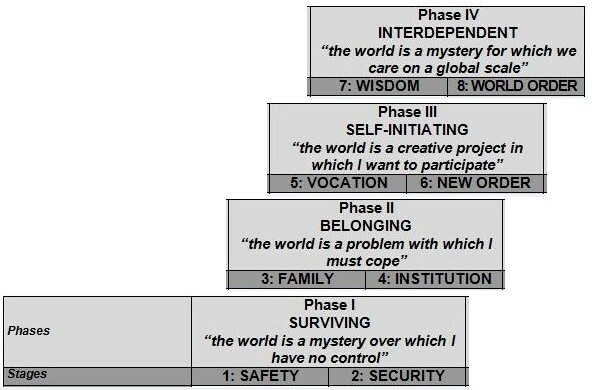 Continually seek to increase your skills in living your values using the model given in Figure 6 and explained further in the animate. 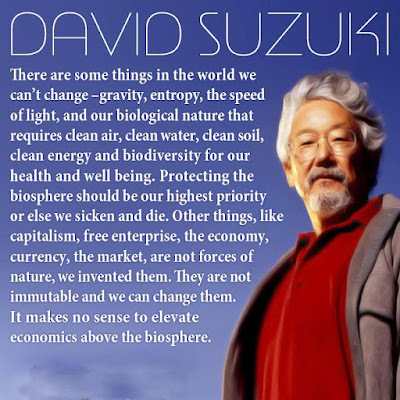 Because we are part of nature, we cannot live our values any way we want, so live your values in consideration of other life on this planet. Put simply, personal growth is synonymous with values-based skills development. Click here for a case study where this approach is applied to living the value health/well-being. The fastest way of shifting people's world-view is through deliberately provoking a "significant emotive event"--brain washing techniques are an extreme example of this. If you think people would never resort to these techniques, think again! The question we must ask is, are techniques which deliberately provoke "significant emotive events", ethical? The debate around this issue could rage on for years, however, the debate can be completely side stepped. How? Well it turns out that, though creating significant emotive events is a very effective way of modifying a person's world-view, those provoking the event have no control whatsoever over how the person's world-view will change. If you cannot control the outcome, then what's the point of employing the technique? How can one be so sure that you cannot control the outcome? It's a basic principle of chaos theory. When you provoke a significant emotive event in a person's life, you create a bifurcation in their meaning-system (i.e. the way they'd made sense of the world until that point in time is broken down--bifurcated!). The brain's system of making sense of the world--it's meaning system--is as about as complex as system as you can get --in fact it might very well be the most complex system in the universe. Chaos theory tells us that when a bifurcation occurs in any complex non-linear system (not just the most complex in the universe) no one can predict the outcome. So this means, if you deliberately provoke a significant emotive event in a person's life in order to impact on their world-view, you have no control over, nor any way of predicting, what new world-view they will have after the event--how useless then is this as a technique make any change? The video below gives an of of how our Hegemonic society utilizes the media as a tool to dictate gender expression. This sets into motion the subordination of women in our society and that value that they hold as individuals politically and socially. It is a perfect example of how media shapes our worldview and hence our values. "We can't be what we can't see." Worldview is everything. It shapes our values. Then, our values determine our choices in life. 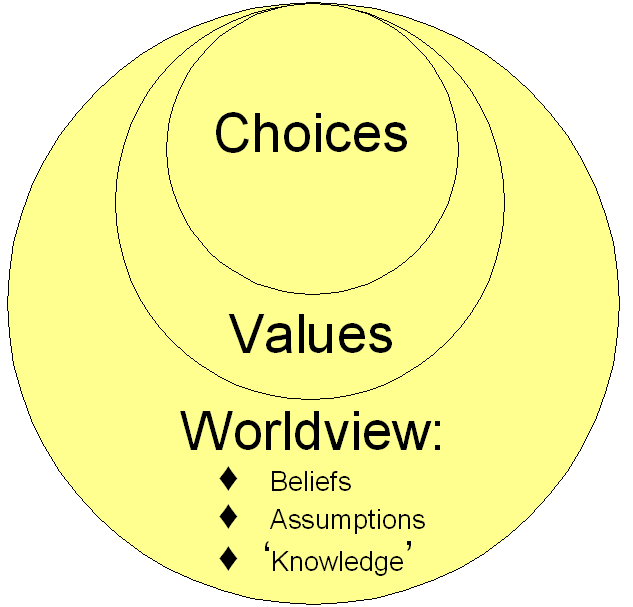 In influencing people's worldview, what works best? What works as both an effective and an ethical means of world-view modification, is the use of a combination of dialogue, experiential learning, and structural change. The key to change is firstly gaining real rapport with people. For genuine rapport to exist, people must really know that you are able to see the world through their eyes and thus really understand why their values are important to them. Definition--a concise explanation of the meaning of a word or phrase or symbol. Descriptor--the phonological or orthographic sound or appearance of a word that can be used to describe or identify something. The saying, "The Tao expressed is not the Tao," gives a clue to a basic problem with definitions. The very process of writing a definition of anything detracts from the true nature of the entity one is attempting to define. The reality is simply that definitions would be impractical to use if they even came close in their attempt to describe anything comprehensively. A descriptor seeks only to provide sufficient information about an entity so it can easily be identified when compared to other entities. An alternate definition of descriptor is: "a piece of stored information that is used to identify an item in an information storage and retrieval system." So when a descriptor is used with human values: "A value descriptor is a piece of information used to identify a particular value." When formulating each value descriptor, the Key Affiliate team used a set of criteria to evaluate the efficacy (capacity or power to produce a desired effect) of each. Identify values which have like roles and work with the identified set of values. (For example, control/order/discipline, law/duty, law/guide, accountability/ethics, etc. 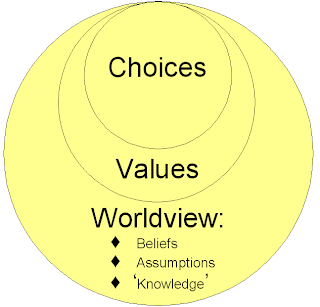 all have an ordering role within their respective world-view -- each world-view has different beliefs about how the ordering should be effected, therefore, each world-view has a different value giving expression to the beliefs.) In working with the new descriptors for a set of values, we must ensure the role for each value within its world-view is maintained, and each descriptor clearly distinguishes each value in the set from the others. Keep the value label and its descriptor simple using more common-usage words. For example, Collaboration/ Subsidiarity could become Collaboration/ Delegation. Use word senses which are the most common interpretation of the word. Ensure the descriptor of a value makes it simple to distinguish it from other values, particularly from other values which have labels of like-senses such as, for example: Cooperation/Complementarity, Collaboration/Subsidiarity, and Interdependence. Not use other value labels within the descriptor. Not provide examples of how the value may be lived -- this narrows the descriptor and could bias its meaning. Ensure it facilitates the process of people working through the VAK questions to identify how they are living the value in their life. Is it constructed from common-usage words? Does it use words such that their most common meaning-sense is the sense intended? Does it faithfully describe its role in the world-view to which it belongs as a focus value - i.e. is it congruent with the beliefs of its world-view? Is it sufficiently different from other values whose labels have like-senses? Is it free of other value labels? Is it free of examples of how to live the value? Is it easily used with the VAK questions? In IT jargon, a descriptor which meets a set of desired criteria, is be said to be well formed. 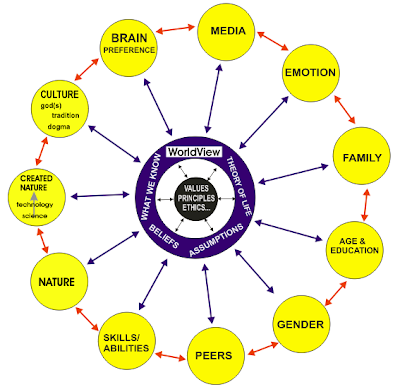 A World-view is your personal model of the world. It comprises your beliefs, your knowledge, and your assumptions about the world. As your world-view changes, you see the world differently, and therefore your responses to situations and circumstances also alter. "I have met the jailer and he is I. We are all trapped by our own world-view." How Do I Run a "Future Search/Creation Conference"
everybody, experts included, improving whole systems. In his book, Discovering Common Ground, Marvin Weisbord described himself as an entrepreneur and author. From 1969 to 1991, he worked as a consultant to business, education, government, medical, non-profit and voluntary organisations in North America and Scandinavia. In 1991 he started Workplace Revolution, a non-profit programme to help people apply the consensus-building ideas embodied in Discovering Common Ground. Other enterprises in which he was involved included: being a partner in Block Petrella Weisbord, a firm established to help people restructure their work; and a partner of Blue Sky Productions, a video company documenting innovations in self-management around the world. ...I have a personal mission. There is a growing world-wide interest in improving the quality of life, at home and at work. I believe that represents common ground for every person living. I would like [Discovering Common Ground] to serve as a catalyst for an informal global support network of people exploring and extending the use of [Future Creation Conferences]. We have a unique opportunity to learn from each other and to amplify one another's processes. ...I hope to encourage concerned leaders everywhere to experiment with [the Future Creation Conference] format. I believe that this mode constitutes a learning laboratory for 21st Century strategic management. The Minessence Group views itself as part of the envisaged informal global support network - his personal mission is completely congruent with our own vision, i.e. "To create a world where life is meaningful." A much broader cross-section of "stake-holders", than is usual, are invited - a widely diverse group of people who affect each other but who rarely or never meet. The participants self-manage tasks of discovery, dialogue, learning and planning. Participants explore together the WHOLE system - its history, ideals, constraints, opportunities, global trends, within and without, rather than just the parts that are closest to home and soaking up the most energy. [During the future creation conference] we will nearly always find unresolved conflicts and disagreements. We discourage conferees from "working" their differences. Instead, we create a figure/ground reversal. We put the dysfunctional "shadow" dynamics in the background. People don't magically get better than they were. Rather, they tune in on different aspects of themselves - the more constructive and cooperative impulses.Indeed, we neither avoid nor confront the extremes. Rather, we put our energy into staking out the widest common ground all can stand on without forcing or comprising. Then, from that solid base, we spontaneously invent new forms of action, using processes devised for that purpose.In short, we seek to hear and appreciate differences, not reconcile them. We seek to validate polarities, not reduce the distance between them. 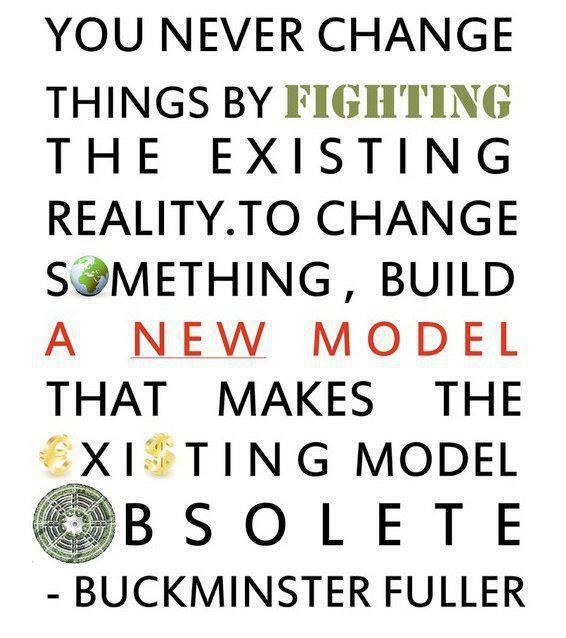 We learn to innovate and act from a mutual base of discovered ideals, world-views, and future goals. Above all, we stick to business. We make the conference's central task our guiding star. The best way to learn about future creation conferences is to run one. So here are some guidelines for putting one together. The suggested format is one developed by William Smith (1992, pp. 171-186). Smith's model is specifically designed to promote a horizontal flow of power in organisations in place of the usual vertical flow of power. Having a horizontal flow of power, rather than a vertical flow, is an essential requirement of the culture of any organisation desiring to be an effective learning organisation. At the top, the "institutional" level, the appreciated environment is dealt with. They ensure survivability of the organisation through linking to the needs values by society. Their main output is policy. At the "managerial" level, the most influential strategy for the implementation of the policy is chosen. 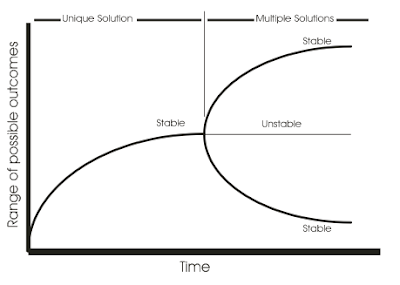 The main outputs are strategy and structure. At the "technical" level - traditionally the level considered to be the most concerned with control - attempts are made to reduce uncertainty through producing concrete plans, rules and regulations. Day 1 is devoted to understanding realities and possibilities (appreciative learning). Intended participants asked to gather and research any information they may feel relevant to the main topic prior to the first day. They would also be encouraged to pass this gathered material on to other participants in whatever way they believe will have the most success in transferring the insights they've gained to others. This transference (appreciative learning) continues until the completion of Day 1. By the end of Day 1, common ground is identified. Day 2 is devoted to selecting and debating priorities. Day 3, guided by the chosen priorities, sets out an action plan to ensure the priorities are addressed in an agreed time line. Action Learning Projects are set up to turn the plans into action. We, at the Minessence Group, are keen to link with others in transforming the world into one where the well-being of as many people as possible is enhanced. The mechanistic model of the universe, developed some centuries ago, still dominates the way we treat each other, particularly in the workplace. People are not machines, robots, human resources or valuable assets. What distinguishes people from machines is values. People have values - machines do not. In order to tap into, and to respect people as human beings, we must be sensitive to their values and design our relationships, teams, organisations, society and civilisation to be in tune with these values. We believe Future Creation Conferences will make valuable contributions to this much needed transformation. APPLIED COMMON SENSE: The equation goes something like THE RIGHT TASK + THE RIGHT PEOPLE + THE RIGHT SETTING = UNPRECEDENTED ACTIONS. That sounds a lot of applied common sense. Why, in most institutions, is it not commonly applied? I have to keep reminding myself that the (probably unconscious) function of old paradigm meetings is not breakthroughs, but control. ...To implement effectively we need a shared picture of the "whole system" - future vision, values, policies and procedures in a global context. This calls for broad face-to-face joint planning. ...The outcomes can be quite startling. They range from grass-roots community action to stimulate new businesses and jobs, to revitalising a major company's total quality program, to setting future policy for a national banking system, to making policy for whole nations. Smith, W. 1992, "Planning for the Electricity Sector in Columbia", in Discovering Common Ground: How FUTURE SEARCH CONFERENCES Bring People Together to Achieve Breakthrough Innovation. Empowerment, Shared Vision, and Collaborative Action, Berrett-Koehler Publishers, San Francisco, pp. 171-186. Weisbord, M. 1992, Discovering Common Ground: How FUTURE SEARCH CONFERENCES Bring People Together to Achieve Breakthrough Innovation. Empowerment, Shared Vision, and Collaborative Action, Berrett-Koehler Publishers, San Francisco. Control Values are necessary to maintain and bring together various organisational sub-systems. They include values relating to efficiency, discipline, and performance standards. These values guide such activities as planning, quality assurance, accounting and re-engineering. Examples of Control values include: Efficiency/Planning, Control/Order/Discipline, Law/Rule, Management, Rationality and Financial Security. Relational Values guide people’s behaviour in a group setting. These values are based on beliefs about how people should conduct themselves in public, at work and in relationships. Examples of Relational Values are Honesty, Congruence, Respect and Loyalty. 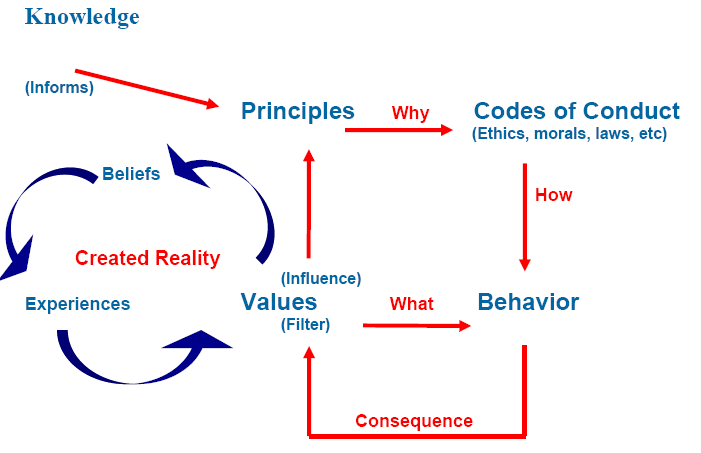 Relational Values influence how people behave and relate to each other when living their Control and Developmental Values. Developmental Values are essential to create new opportunities for growth. They are values related to creativity, growth, knowledge expansion and innovation. Examples of Developmental Values include Creativity, Self-Actualization, and Growth/Expansion. In relation to leadership styles, the natural style for people whose dominant values are Control Values, is Transactional. For people whose Developmental Values are dominant, their natural style is Visionary. It follows that people who prefer to put most of their energy into the Relational Values will have a Facilitative style. Values based strategic planning is grounded in the knowledge that there is a close connection between the successful execution of organisational strategy and the actual values of people charged with its execution. The Control, Relational & Developmental values sets, when employed in strategic planning, underpin three related types of strategic focus, which, while not mutually exclusive, require very different skills. We have developed a CRD Profile which enables groups to identify their dominant set of CRD Values. This information enables them to formulate long-term group strategy in a way that is congruent with their values and therefore have the best chance of successful execution. 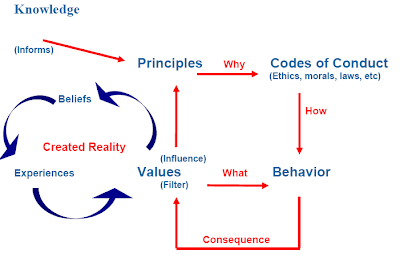 Values alignment is an emergent property in organisations that have a critical mass of people with a common language of values and clarity about how their personal values, personal vision/mission and goals align with the desired values, mission/vision and goals of the organisation. Position #1: Low personal job satisfaction/low job performance. An employee at position 1 is attaining very little personal satisfaction from working in the organisation. Similarly, the organisation perceives the person as under performing. Position #2: Low personal job satisfaction/high job performance. An employee at position 2 is perceived by the organisation to be a high achiever. However the individual is receiving little personal satisfaction from working in the organisation. Position #4: High personal job satisfaction/high job performance. An employee at position 4 is in an optimal position. Their personal values are highly aligned with the organisation’s values, and they are perceived as a high achiever. Obviously position #4 is the optimal scenario from the individual employee as well as the organisation’s perspective. The key to this position is for both the individual and the organisation to have clarity about their values, a well-defined sense of vision/mission and a set of meaningful objectives. A free survey is available at http://bit.ly/db38j9 for you to explore values alignment within your own organisation. 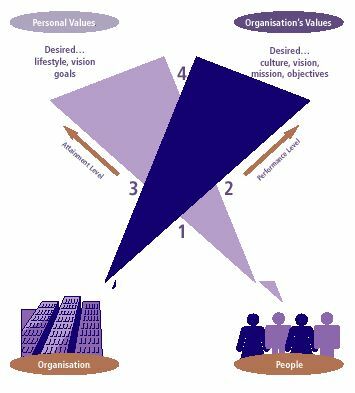 The Optimal Performance Model, illustrated below, provides a useful framework for conducting an organisational wide values program for the purpose of setting the right conditions for values alignment to be an emergent property of the organisation. Concretization. Concretizing their top 10 priority values (using techniques such as: asking VAK questions about each value, concept mapping, and/or Repertory Grid). Purpose. Having regard any published organisational values, formulate personal and group values, vision and mission statements. Make statements which are uplifting and motivating. "How do your top 10 values compare to your group/organisation's top 10 values?" "What common ground do you see?" "If your values are markedly different to the group/organisation's values, can you see a way you could happily live your own values whilst at the same contributing to the group/organisation's values?" "How does the group energy management profile compare with your personal profile?" Capability. "Do all in our group have the skills, resources and abilities to live our values in our workplace?" 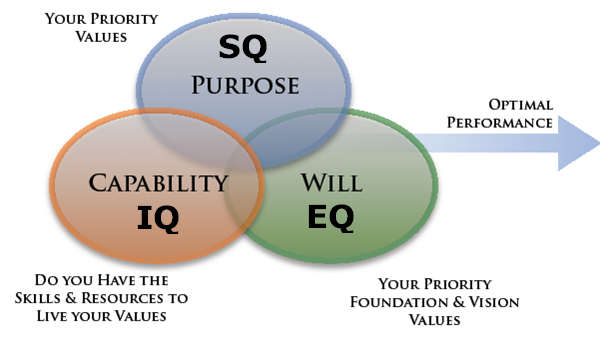 SQ = Spiritual Intelligence, EQ = Emotional Intelligence and IQ = intelectual intelligence, "Do we have the knowledge to develop these intelligences within our group?" The group skills profile indicates the skills needs of your group based on the values you all have. "What are the implications of this profile for your group?"